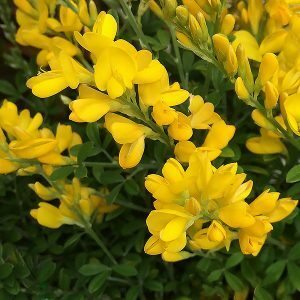 An evergreen shrub, Cytisus racemosus nana is commonly called the Dwarf Yellow Broom. Masses of yellow flowers from spring into summer will almost cover the plant. This is a great landscaping plant for tough dry conditions. It is regarded as being drought tolerant and has a fairly fast growth rate. The species itself can reach over 3 metres in height, the dwarf variety is said to reach around 1.5 metres, however it can get taller than this in good conditions. This is a shrub that adapts well to range of conditions. It thrives in full sun and copes well with poor soils. After flowering, prune back to maintain compact bushy habit. This is a very hardy plant that copes with coastal conditions, strong winds and strong direct sun. It will only tolerate light frosts, C. scoparius is more frost tolerant. Cytisus x dallimorei ‘Lilac Time’ – Lilac flowers as the name suggests.